Started tearing down the 1992 EVO motor this past weekend. 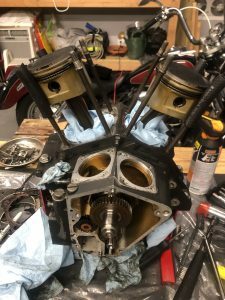 Removed the rocker boxes, cylinder heads, pushrods, tappet guides, etc. Nothing too exciting. Just getting it all stripped down to hopefully bring it back to life and use it as the base for a new bike build. This is gonna be a good time! So far so good. Keeping the front and rear cylinder parts organized and separated. Labeling things with a sharpie and some painters tape. Biggest issue I have run into so far is getting the gaskets cleaned up. 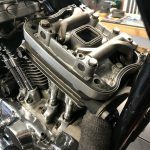 The bike was rode hard (really hard, it had nearly 200,000 miles on it) prior to replacing this motor with the S&S 96″. For a bunch of years it has just been sitting in the corner of the garage. There is a ton of caked on road grit on everything and a lot of the paper gaskets are well stuck, I’ll get it all cleaned up it is just going to take some time, patience, and elbow grease. The picture below shows the progress from the weekend. 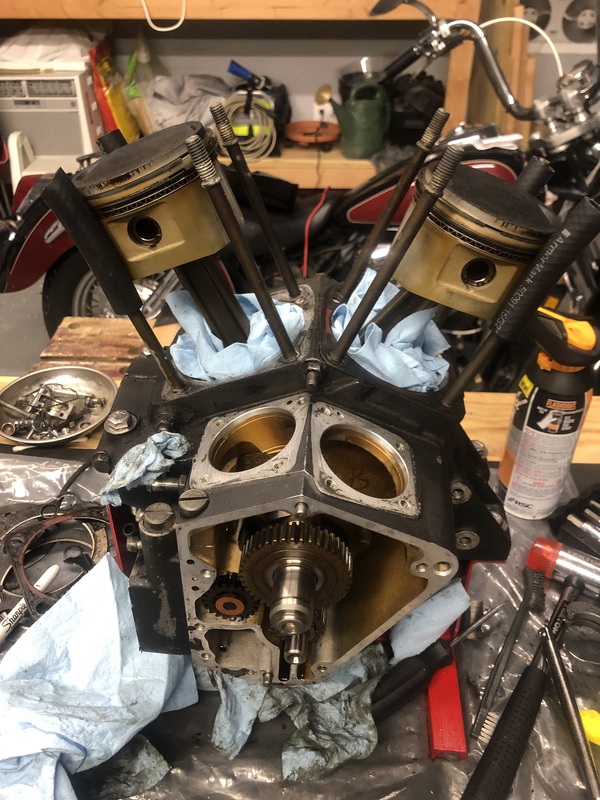 Still need to pull the pistons but I am having trouble getting the pins out, I ordered a wrist pin puller which will be here later this week. I am not planning to split the cases, but we will see what needs to be done. I hope I don’t have to split the cases. 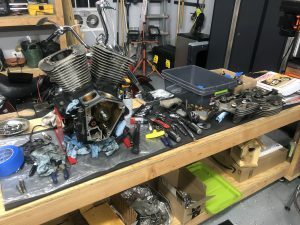 I should have sometime over the Thanksgiving holiday to finish the tear down and then get things to into the parts washer to get everything cleaned up. After that it will be time to figure out what all I need and I’ll start ordering parts.